Charleston, South Carolina is a seminal work from Robert Frank's 1958 book "The Americans", which consisted of eighty-three photographs made largely in 1955 and 1956 while Frank traveled around the United States on a Guggenheim Fellowship grant. The images revealed a fractured society wrought with alienation, angst, and loneliness. 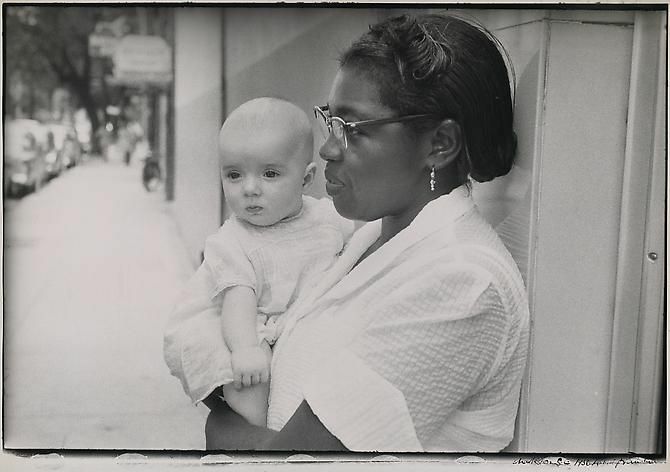 The present work, of an African-American woman holding a Caucasian baby, highlights the racial and socioeconomic disparities present in 1950s America. Frank has repeatedly broken accepted rules and confronted well-worn conventions to expand the expressive potential of the photographic arts. Frank pioneered a revolutionary approach to photography and film making that combined autobiography, poetry, and emotion with the logic of gritty realism. His portrayal of the tension between the personal and universal - the internal and external worlds - is legendary, and has won him a place among the world’s most important photographers. Frank was born in Zurich, Switzerland in 1924 and emigrated to New York City in 1947. He currently lives and works in Nova Scotia and New York.